ooking for a gorgeous brand new home to lease? Then run, don’t walk to this BRAND NEW HOME now available for an annual lease at exclusive Trevesta, where the entrance to the community features a fabulous waterfall, the location is close to everything, and residents enjoy a state-of-the-art Amenity Center which comes with a full-time Lifestyle Director and includes a resort style pool, zero entry pool access, splash zone, playground, covered lanai, and a 24-hour gym. 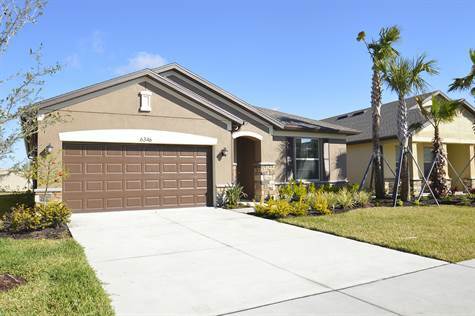 This lovely 3-bedroom, 2-bath plus den home has tall ceilings, an 8' frosted glass entrance door as well as beautiful granite countertops in every room & new carpet/tile throughout. The modern open concept floor plan includes a kitchen w/a large island, a stainless-steel refrigerator, microwave, dishwasher, oven, pantry & plenty of cabinet space. The kitchen is open to the dining room & living room, which overlooks the extended covered lanai. The Owner’s Suite is situated away from the guest rooms & has a walk-in closet & Spa Bathroom. There is also a large laundry room w/new washer & dryer as well as a drop zone space! You will LOVE the extended covered screened-in lanai overlooking a beautiful tranquil pond, perfect for entertaining. No neighbors are behind this home either, so your privacy is ensured. Whether you work & play in Bradenton, Palmetto, Parrish or St. Pete, this location is terrific. Trevesta is situated for quick access to highway 275 and fabulous shopping, fine dining, sports and entertainment are all just minutes away.